Symptoms: Two amplifiers, both barely working. Of all of the amplifiers I’ve rebuilt, I’ve never encountered an amplifier with so many bad capacitors as I have on these amplifiers. Compared to Wurlitzer, Seeburg must have been trying to use the cheapest capacitors they could get their hands on. I suppose a lot of it has to do with how many hours the jukebox was on and the temperature inside the amp chassis. I replaced all of the electrolytic capacitors on both amplifiers. As I pulled each one out, I was hard pressed to find one that was within 20% tolerance of its original value. And many were not even close, such as a 50 uF reading 0.6 uF. In addition to the electrolytic capacitors, many of the paper/foil capacitors have been bad as well. These capacitors play a variety of roles, mainly used to block high voltage and couple the audio from each vacuum tube stage to the next. Failures with these capacitors, usually high current leakage, will usually cause a tube to be biased incorrectly. This is especially important in the final power amplifier stage and in the “cathode follower” stage just prior to the volume control. Also, with the SFHA1 in particular, the Automatic Volume Compensation (AVC) circuit will cease to work. And when this happens, most people pull the 6BJ6 tubes to disable the AVC circuit, which explains why many amps of this vintage are missing these tubes. One might be tempted to replace every capacitor, but given there are nearly 80 capacitors in this amp, I prefer to replace all of the electrolytics (21 capacitors), since they have a finite life, and then replace the others (which, in theory, should have a longer life) as needed. Below I list some of the problem non-electrolytic capacitors. 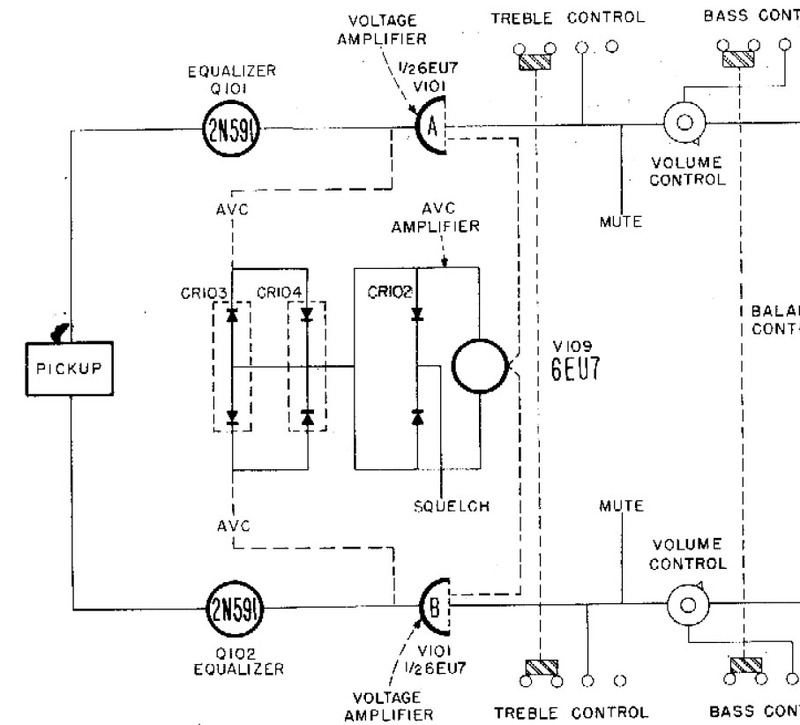 If you read on, you should have a schematic to refer to. 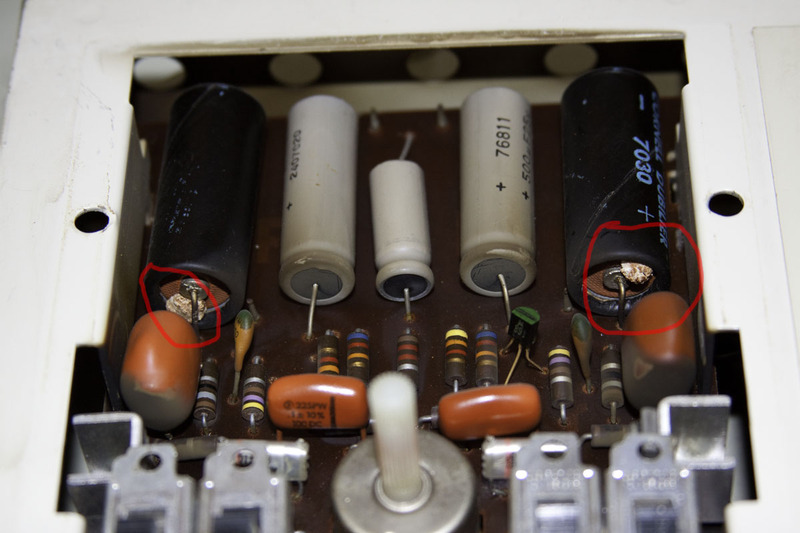 On both of these amplifiers, C108 and C147 (0.22 uF, 400V) were leaky, causing attenuation of the audio signal, even when the AVC tubes (6BJ6) are removed. This is usually the reason one channel might be louder than the other. These are very large and mounted to the rear side of the larger circuit boards near the sides of the amplifier chassis. On both of these amplifiers, C121 and C160 (0.005 uF, 400V) were leaky, causing the voltage on V103, V109, pins 7 and 8 to be too low. This causes clipping and thus distortion of the audio waveform. The voltage on the schematic for pin 8 (cathode) is listed as 90V. Before the bad capacitors were replaced, it was reading around 14V. This circuit is the “cathode follower” I mentioned above. These capacitors were among the first to be installed and are buried deep under everything else. These capacitors connect between Pin 7 of the tube and the wiper of the treble control. 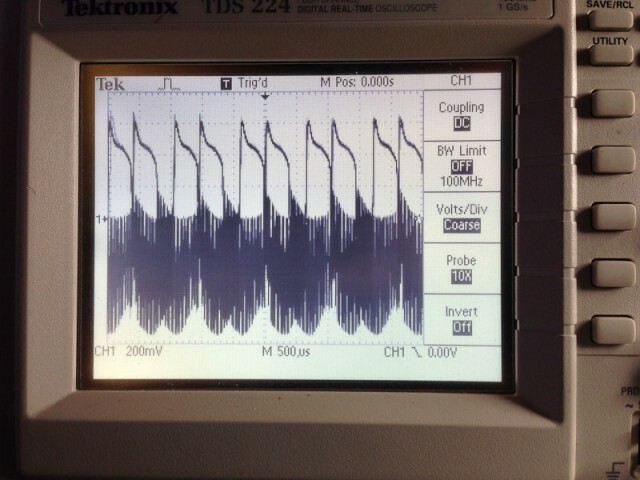 One amplifier had some distortion in the waveform in one channel that was caused by C110, C150 (0.005 uF, 400V). When there is no signal coming into the amplifier, the voltage across C115 (1 uF) should be zero or within a 1 or 2 volts of zero. If it isn’t, then C111, C148 (0.01uF 400V) should be replaced. One channel on each amplifier had a leaky capacitor. Likewise, when you have a 4 – 8 mV signal on the amplifier inputs, and pin 3 of muting socket is grounded, the voltage across C115 should be 30 to 50 volts. If it isn’t, and everything else is working, then C115 itself is the problem and should be replaced. One amplifier had this problem and the voltage would never go above about 6 volts, in spite of being nearly 50 volts of signal at the cathode of the selenium rectifiers. The 6973 tubes are used in pairs for each channel. They operate in a push-pull configuration. If the bias of the grid is not correct or if one tube is weaker than the other, the circuit doesn’t work very well. It’s like a teeter-totter, where the people on it should be nearly the same weight to have a good balance. On the 6973 tubes (V105, V106, V111, V112) you should see -33 to -35 volts on pins 3 or 6 of each tube (with no input signal on the amp). A leaky capacitor will cause the voltage to be more positive. The capacitors associated with each tube in the order listed above are C137, C138, C175 and C176 (0.05 uF, 600V). On one amplifier, all 4 capacitors were bad. On the other amp, all were good. I had a bad 5U4 that was shorting and blowing the fuse. I had one pair of 6973 that was bad on each amplifier (these should be replaced in pairs). I had a bad 12AX7 on one amplifier. And one amplifier had missing 6BJ6 tubes. With the exception of the 6BJ6 tubes, there are companies still making vacuum these tubes. 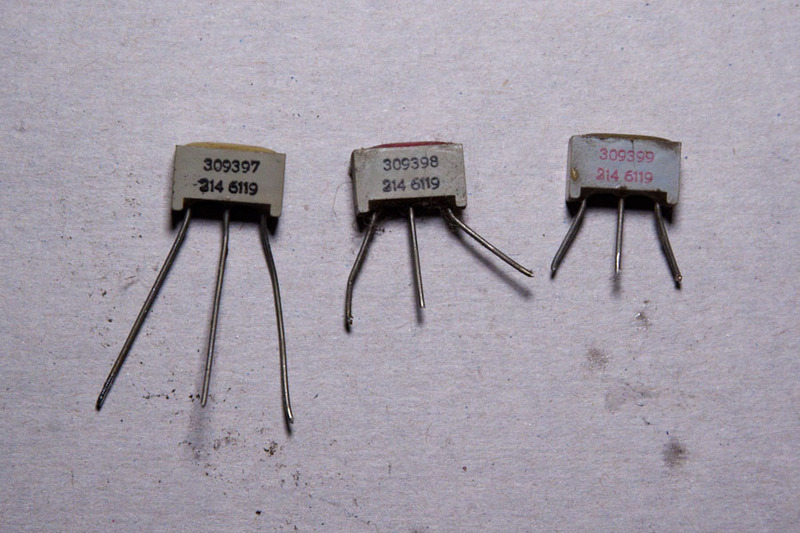 Try finding a company still making vintage transistors. 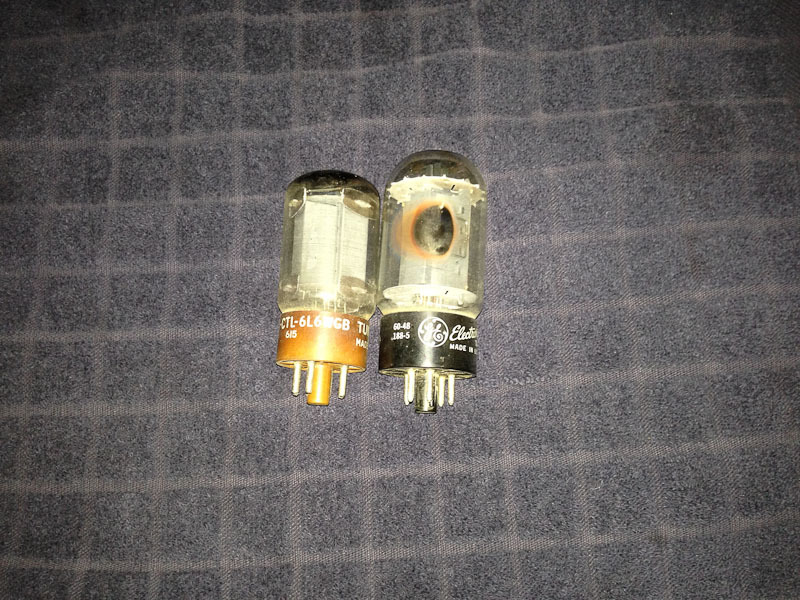 I highly recommend Vacuum Tube Supplies in Denver for anything related to tubes and tube amplifiers. When I listened to the amp, I didn’t really hear anything in particular that was wrong with it. But the owner was unhappy with it. Someone had previously done some work on it, replacing a few capacitors, including the main filter capacitor on the output of the 5U4 rectifier tube. I brought the amp back and bench tested it. It failed. Amplifier working normally at 50% volume. Amplifier breaking down and oscillating at slightly higher volume. Amplifier in bad shape at full volume. The problem was primarily in the power supply as these waveforms were measured at the Aux Amp output, which is essentially the output of the preamp stage. 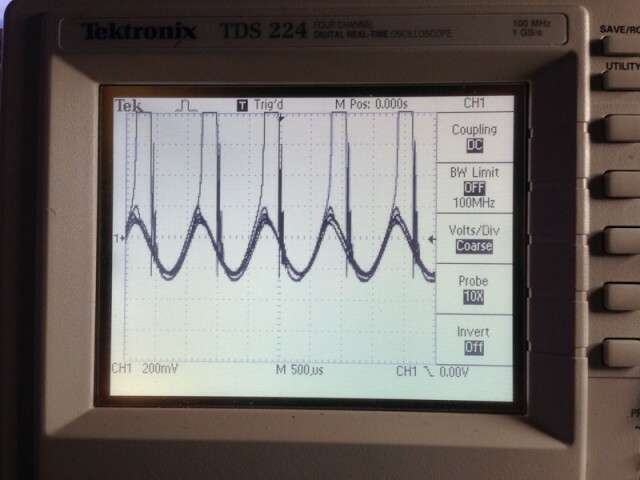 The final output stage was loading the power supply and breaking into oscillation. 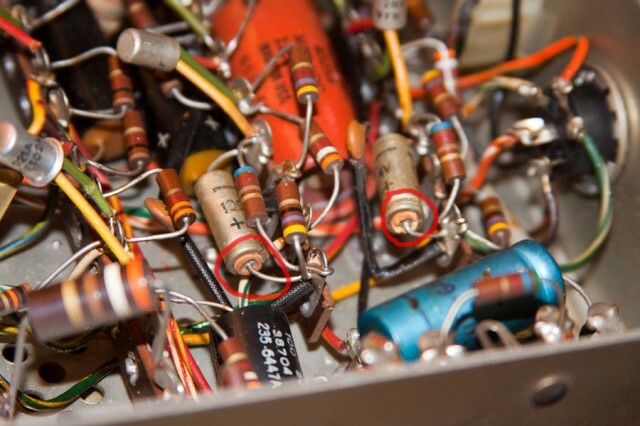 Most often when an amplifier breaks into oscillation, there is a faulty capacitor someplace. I decided to do my standard “re-cap” where I replace all of the electrolytic capacitors and some of the rolled capacitors of smaller values subjected to high voltages. I tested some of the old capacitors once they were out of the circuit (except in rare cases, capacitors can’t be tested while they are in the circuit). There are two large can capacitors that contain four capacitors each. All of the capacitors in one of the cans were dead (reading very low). All of the capacitors in the other can were better, but all were out of tolerance. Those cans probably were the culprits of the oscillation. Unmatched 6L6 tubes, not even from the same era. The one on the left is military surplus. The one on the right might be original. Both Wurlitzer and Seeburg amplifiers of this era use 6L6 tubes in the final stage of the amplifier. 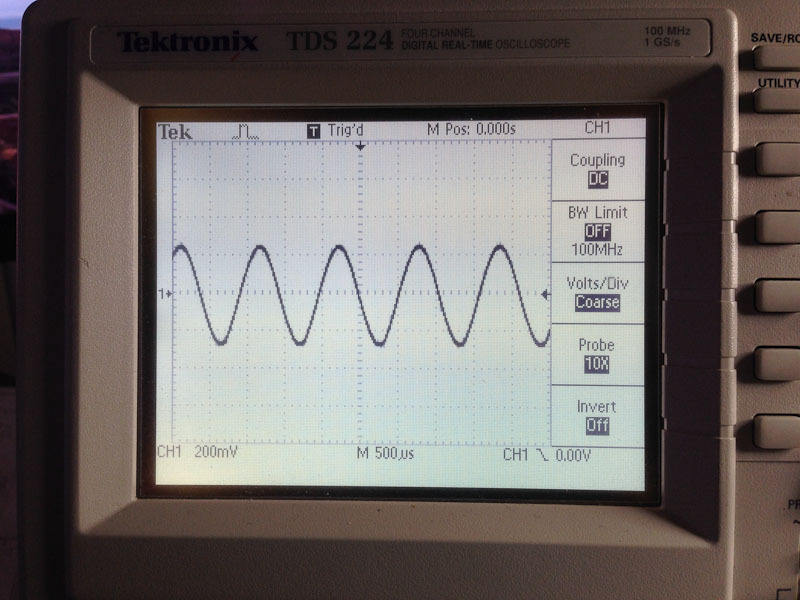 From a theoretical point, the two tubes should be gain-matched because one tube drives the upper half of the waveform, the other tube drives the lower half of the waveform (a.k.a. push-pull amplification). But these amplifiers seem to be pretty forgiving if the tubes are not matched. I once saw a Seeburg operating with one 6L6 tube missing. The owner and I decided to go ahead and get new output tubes. The nice thing about 6L6 tubes is that they are still being made today due to their popularity for use in guitar amps. After all the work was finished on the amp, it tests perfectly at all volume levels. In an odd quirk of fate, I’ve had a rash of jukebox amplifiers to work on, as well as some Seeburg control centers. The amplifiers are a Wurlitzer 532, Seeburg TSA1, Seeburg SHP3, and an amp from a Rockola 424. The 532 is the oldest and the SHP3 is the newest. Testing a Wurlitzer 532 amplifier. At the customer’s house, the 532 was exhibiting all kinds of problems. The sound was popping, cutting in and out, and most of the time was severely distorted. One of the items that was causing all of the popping was a bad connection in the octal socket between the mechanism and the amplifier. The power to the amp runs out, and back in, through the connector (except for the tube heaters which are on all of the time). Also the amp has a rectifier on it which supplies power to the mechanism. Each female pin on the octal socket is shaped like a “U”. Over the years with the plug being unplugged and replugged, the top part of the “U” spreads apart and doesn’t make a good connection with pin. I took a sharp ice pick and poked it down into the edges of each hole and bent each arm of the “U” so they would be closer together. That solved that problem. However, there was still a lot of distortion. I opted to bring the amp back for a bench test. With a bench test, I can inject a known signal and trace it through the circuit with an oscilloscope to see where the signal breaks down. In this case, it was bad at the output of the first tube in the chain. It wasn’t a bad tube, but a bad electrolytic capacitor connected to the cathode of the tube. The amplifier will be getting re-capped (replacement of all electrolytic capacitors). It’s overdue. At the customer’s house the amp was distorted especially in the lower frequencies. Changing the volume had no effect. It seemed to be in both channels. There wasn’t good stereo separation. I brought the amp back for bench testing. 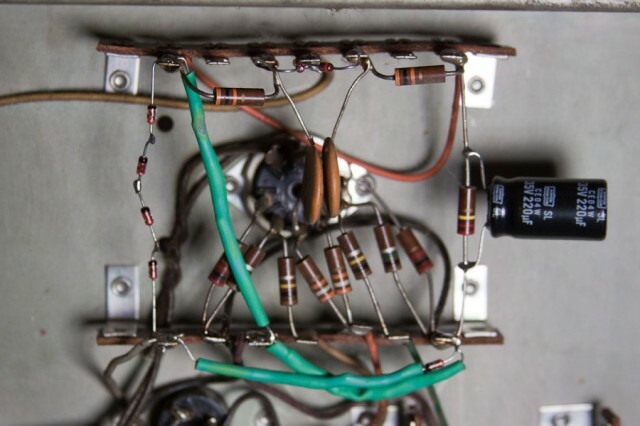 There is a coil in the amp that connects the left and right channels together. I’ve seen this in other jukebox amps of the late 1960’s, and it doesn’t make sense. After I disconnected it, I discovered the distortion was only in a single channel. And it took me a while to discover it as I had to drive the input fairly hard for it to show up. And it was more prevalent at bass frequencies. It looked like someone was taking a bite out of the lower side of the sine wave (it wasn’t at the peak). After checking the bias and the caps around the preamp stage where the problem was, I concluded it had to be the transistor. I replaced it, and the problems cleared up. 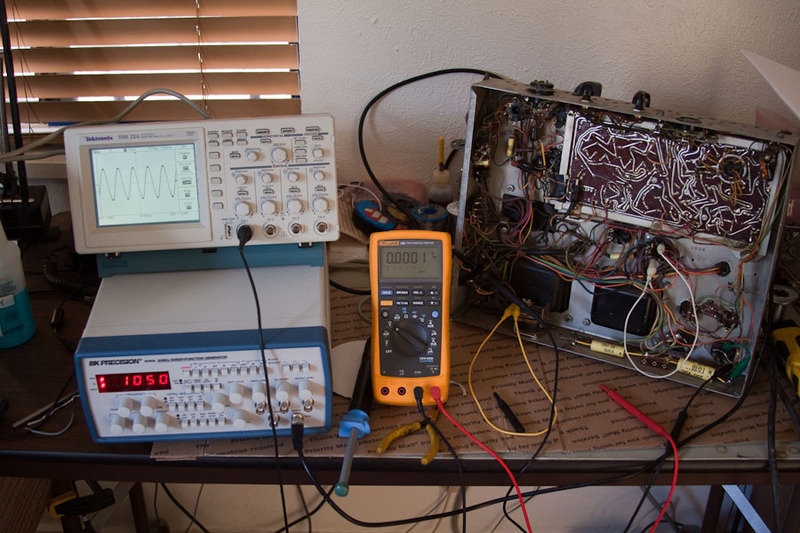 I chalk that one up to weird transistor failure. The service manual calls this a 40276A. The amplifier itself has 40218 labeled on it. Regardless, one channel was completely dead. 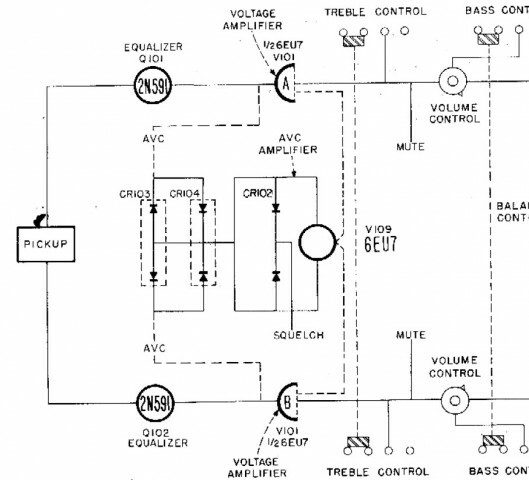 The mono switch didn’t have any effect, so the problem was in the output stage. I brought it back for bench testing. I quickly discovered the 1200uF capacitor used in the feedback circuit had a broken lead. This amp had been previously worked on by somebody else and they had replaced the capacitor without securing it well. The vibration of moving the jukebox to Colorado from the east coast probably caused it to break. Since the lead was broken right at the capacitor, it needed to be replaced. While checking out the amp, I noticed some electrolytic capacitors where leaking. Those 100uF capacitors got replaced, as well as the main filter capacitor (2940uF was replaced with a 4700uF). After cleaning the preamp wirewound pots (not easy or effective), the amp is working well. 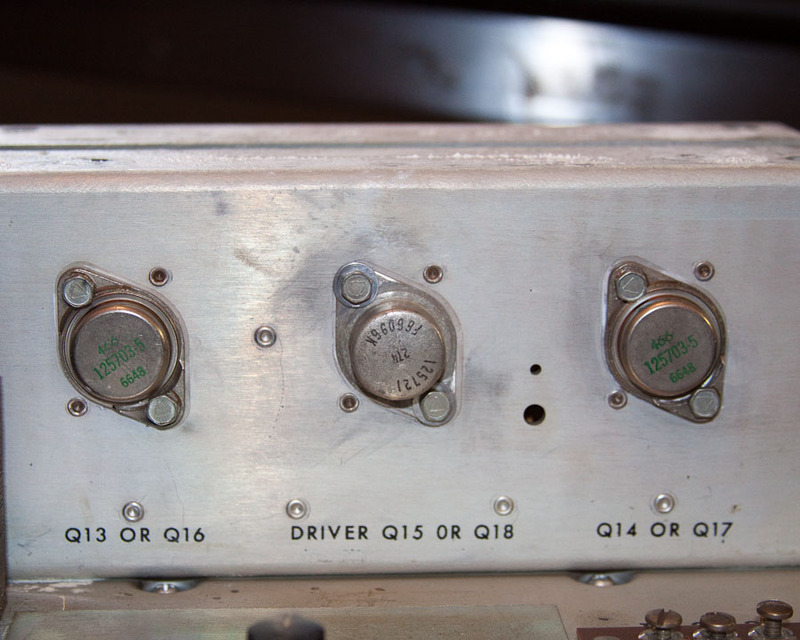 The Seeburg SHP3 amplifier will be covered in a future post about a Frankenstein jukebox.